Secure anchor points to prevent dislodgment in strong winds. The holding strength of the mounting assembly is very important and is dictated by the size of the solar panel and how it is positioned. A small solar panel that is mounted flush with the roof surface requires less holding down than a large solar panel that is tilt mounted . Maximise sun exposure. Solar panels must face directly at the sun to get most sunlight,as the sun moves away the solar power produced by the solar panel drops off. For most of Australia solar panels must be positioned facing north and tiled upwards to harvest the greatest amount of sun throughout the year. The northern regions of WA , NT and QLD that lie north of 23° will see the sun in the south during mid-summer. Flush mounted solar panels can be installed on a north facing pitched roof by using the tilt of the roof to obtain sufficient sunlight. Flush mounted solar panels should not come into contact with the roof, always raise them at least a couple of centimeters to allow airflow to aid cooling in summer. This it the preferred method of mounting a solar panel on a flat (horizontal) roof or a pitched roof that is not north-facing. It consists of two rails that support the solar panel, the front rail is lower than the rear rail to tilt the panel toward the sun. Select the length of the rear legs to obtain the best tilt. Pole or post mounting is the best method to install a small solar panel because they don't get as hot as roof mounted panels in hot weather. Adjustable angle post-mounting brackets are best for obtaining the best tilt for your location. Ground mounting assemblies are similar to roof mounted tilt frames but instead are attached with anchor bolts to the ground. Even a few dead leaves lying on a solar panel will reduce power output by a large amount. The worst setup are horizontal solar panels or panels with only a very slight tilt that allows dirt and debris to accumulate on the panel surface. Roof mounted solar panels must never be installed where even a small portion is shaded by nearby structures or vegetation. Solar panels for lighting should be facing directly at the sun around midday during mid-winter because winter nights are longest and power requirement is greatest. This also generally applies for off-grid solar power. 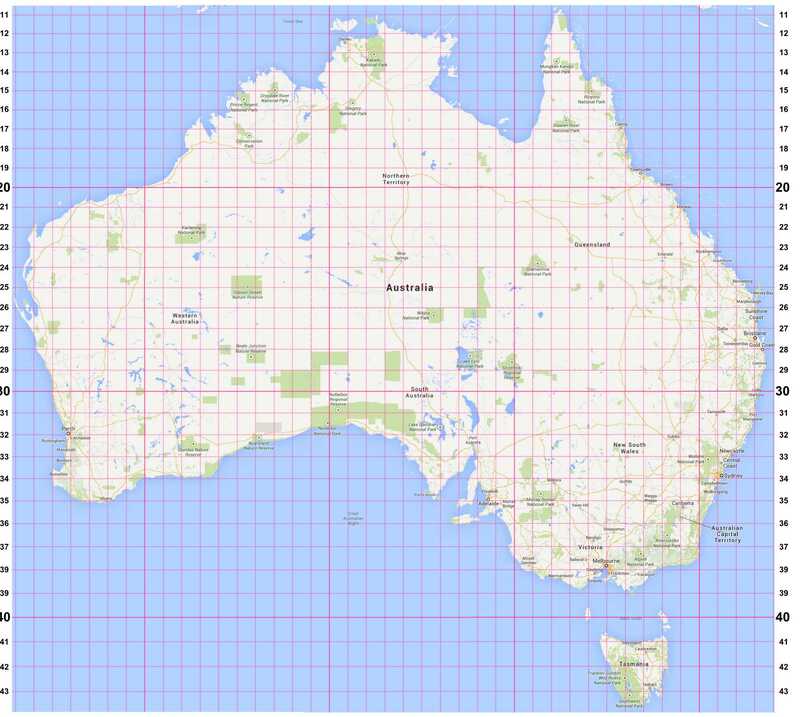 Australia is a big country so the tilt angle required to get the most sunlight varies from north to south. Calculate the best solar panel tilt angle for mid-summer by subtracting 23° and for mid-winter by adding 23°. For example:Alice Springs latitude is 23°, there the midday sun is directly overhead in mid-summer and 46° north in mid-winter. In Perth, WA it is at 9° north in mid-summer and 54° in mid-winter. A negative reading means the solar panel should face south, for example: solar panels in Darwin, NT should face 11° south in mid-summer. A solar panel can be positioned so it will be facing the sun for most of the day but it will only produce power according to how many hours of daylight there are in one day for that location and at that time of year. Solar power users refer to the "equivalent peak sun hours" to estimate the amount of daily solar power available. For instance there might be 12 hours of daylight on a certain day but for most of the time the sun is not directly overhead, in fact for most places in Australia the sun is never directly overhead, so the total hours of daylight are converted to the equivalent number of hours that the sun would need to be directly overhead to produce the same amount of solar radiation - the equivalent daily peak sun hours. The maps below taken from the Australia bureau of meteorology website. show equivalent peak sun hours across Australia at different times of the year.